What Exactly is A Small Pool? What Sort of Equipment Do You Need? 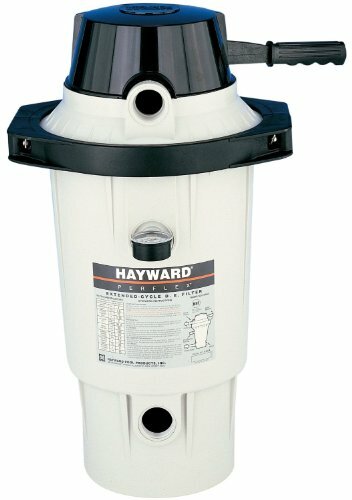 Why Do You Need A Filter For A Small Pool? People like to swim, or at the very least enjoy time spent lounging poolside. Perhaps have pool parties, entertaining friends and colleagues. Outside of cities, many would love to own their own pools. Because of space constraints and a lack of knowledge, most also believe that they can’t be pool owners. The thought of putting in an in-ground pool into a backyard may be daunting. Not everyone is aware that they can maximize the use of their space by adding a small pool to their backyard. Most Importantly people don’t know how to care for a small pool because unfortunately, the most familiar personal pools that everyone, myself included, are aware of are ones that look like this. We’ll talk about what a small pool is and the types. What equipment you’ll need and why. Why this equipment is important to your pool’s health. We’ll explore a list of products to help you choose. Last update on 2019-04-23 at 11:15 Product prices and availability are accurate as of the date/time indicated and are subject to change. Any price and availability information displayed on [relevant Amazon Site(s), as applicable] at the time of purchase will apply to the purchase of this product. Not many people are truly knowledgeable about what truly constitutes a small pool. But small pools are something to look at seriously as they offer good alternatives to the cost and time of larger in-ground pools. The costs tend to be much ess, the equipment is different and the upkeep is definitely not as time consuming. Most people don’t really have any idea of what a small pool is or can be. When one thinks of small pools, the images that popped into the head are probably comical. Most, myself included will likely picture something like this; a pool that all you can do is sit down in, or something that children splashed around in. 600 square feet or less in size no matter the shape. The most known type of small pool is an above-ground pool. There are also in-ground small pools. Just because they’re small doesn’t mean they aren’t for swimming. 600 square feet can be of any shape. The kidney shape is the most common type, followed closely by square and triangular shapes. While small pools can most certainly be used for exercise purposes, divining isn’t recommended as they’re usually no more that 6ft deep. Take a look at the different types of small pools below, this will help with deciding what you’d like your small pools primary purpose to be. This is the most typical for exercise. It’s triangular in shape to give the most available space to do laps back and forth across the pool. This is preferred by swimming enthusiasts, people who want a whole body workout and competitive swimmers. This type of pool can also be installed either above or in ground. This, just as it’s name suggests, is for relaxing in the sun and entertaining. You won’t get any vigorous exercising done, but that’s fine, that’s not it’s purpose. A recreational pool can be any shape from kidney, to square or round. You can even accessorize it with anything you wish, such as the waterfall in the one below. This is probably the type of small pool most people are familiar with. It’s a good option if you don’t want to spend too much money or time getting your setup ready. They generally have a very simple setup and are usually ready to go in about a day. So theoretically you could buy your pool in the morning and enjoy it by evening. Regardless of whether your pool is chlorine or saltwater, all pools need filters and pumps. Small pools use filters that are made for their specific size and needs. There are a number of different filters that can be used with small pools. 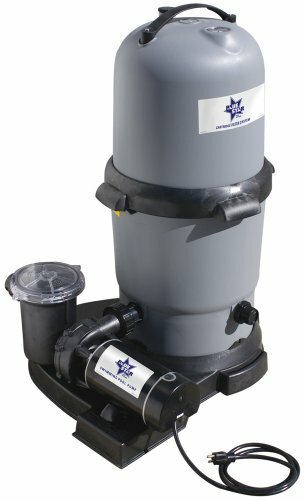 How do we choose the proper filter for your small pool? Well there are certain things to look for when choosing a small pool filter. You could have a professional do this for you, but perhaps you’re a DIY enthusiast and want to learn as much as you can about caring for your pool on your own. The instructions can get a bit complicated, and involves math formulas, yikes! Not to worry, I’ll break it down for you so that you don’t have to do this yourself. Here’s what you’ll need to do. First size your pool. This isn’t something that you usually have to worry about, the measurements will most likely be provided by the manufacturer or your reseller. Find your pools flow rate, this is how much water can run through your filter per minute. There’s a maximum and a minimum flow rate for all filters, so this is important. How long does it take all the water in your pool to run through the filter? This is called the turnover rate and should typically be at least once in a 10 hour period. The right filter will be the one that allows for the turnover rate based on size and amount of water in the pool. How much water resistance will the filter offer your pool? The higher the water resistance, the faster more water can move through it. This is a good thing. It’s ok to go with a filter that’s a little more than the capacity of your pool. Now that we’ve figured out just what you need to do to find a suitable filter, we can decide what sort of filter you’ll need or want for that matter. You can purchase filters on their own, but you can also get a complete small pool pump and filter system. Filters come in three different types. These are Sand filters, Diatomaceous Earth (DE) and Cartridge filters. Regardless of the filter you ultimately choose, the combination of a small pool with filter and pump is the most essential to keeping your pool’s system healthy. Much like the valves of the human heart, the small pool filter pump is the thing that gets the water to where it needs to be. It’s the “heart” of the pool as it were. So we’ve talked about the different types of available filters, and the importance of the pump to the system. Now let’s look at the different small pool filters or systems complete with small pool filter pump on the market for your new pool. Below I’ll provide you with nine of the better filters and systems available, complete with links and reviews so that you can make your own choices. It’s easier to use and relatively inexpensive in comparison to other filter types. It’s low maintenance and lasts eight to ten years on average. It unfortunately will lower the pool water capacity because of how it cleans, and it can throw off your water balance. This is ﻿one of the smaller types of filter and pump systems﻿. It’s less expensive than the average large size sand filter would be. By all reports it does just as much of what people expect out of a sand filter. It’s an above ground only system..
It’s corrosive proof and winter perfect. This is a complete system that includes everything you need to set up and run your filter system. Comes with it’s own hose fittings. Made of durable polyethylene. Complete system that includes: base, pump, filter tank, 4-position multi-port valve, clamps, fittings and pressure gauge. Runs very quietly and is energy efficient. Filter holes may be large enough that they allow some debris in. May get clogged sooner than other filters of a similar type. The provided hoses aren’t as snug and may have to be replaced. Will only work with a 115volt pump. This is a competitively priced pump and filter system that packs a punch. It will keep your water clean and free of growth such as algae, not to mention dirt and particulates. On average it needs to be run about six hours a day. It has a gauge that is colour coded making it easy to read. There is also has a built-in strainer basket for filter tabs. Has a system flow rate of 2,400 gallons per hours. ​There’s a menu control valve that lets you filter, backwash, rinse, recirculate, drain and close the system. ​Includes a safety shut off and an automatic 24hr timer so you don’t need to be there to perform all tasks. Works with both saltwater and chlorine pools. Built-in ground fault circuit breaker. You’ll need to get very specific sand media that is only sold through manufacturer. Laterals are two wide and can cause sand to shoot into the pool at times. Pump may not be able to keep pressure over time and will have to be replaced. Although on the pricier side, this top mount series features a complete system of full flow power pump, filter and a base. The tank is a perfect all weather tank with a multi-port valve. With the combination of power pump and filter, the energy costs associated with running a pump are reduced because you can operate it less frequently. Suitable for all weather conditions, the large sand and water drain so that you can quickly winterizing or service. The valve provides max flow with low pressure drop and seven positions. Included clamp allows for 360-degree rotation which makes installation a breeze. Outfitted with a self-cleaning underdrain a top diffuser and 360 degree slots for even water distribution through the sand filter, for clean water and a balanced flow. ​Multi-port valve has positions for filter, closed, backwash, recirculation, rinse, waste and winter as well as pressure gauge with sight glass. ​Compatible with in-ground, above-ground pools and aquariums. Injection molded and corrosion proof. Clamp allows for 360-degree rotation making installation a breeze. Only 120V with no adaptaion for 240V. Cartridge filters are the middle child small pool filter system and do much the same things that sand filters do, but filter out twice as much dirt and smaller particulates. 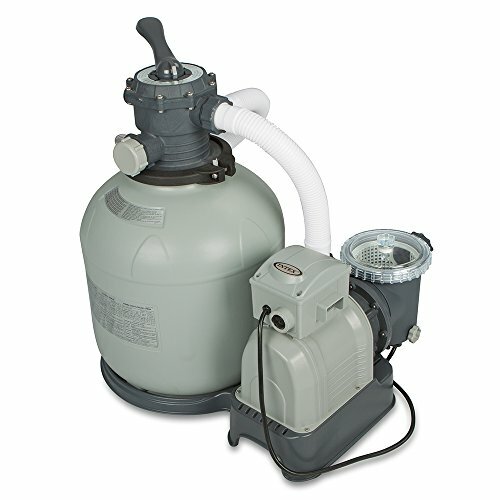 Unlike the sand filter, a cartridge filter is removable and easily cleaned so the build up will be less. They’ll cost less in operation costs as they use a lower pump pressure, but cost more to purchase. They are also lower costs associated with the purchase of pool cleaning chemicals for two reason. Remember how we’d said that a sand filter can throw the balance off of your pool water? That’s because when it removes debris, and cycles the water back into the pool you wind up losing some of your water and whatever pool chemical is in the pool. Because of the way that cartridge filters work however you lose less water and associated pool chemicals because there is no backwashing involved. The water simply gets filtered and cycled back into the pool via the same source. Double insulated pump that ensures longevity. ​Has a built in timer to set the operating times. ​Has automatic preset timers for between two and eight hours. Will need adapters if you want to upgrade the pump. Doesn’t come with plunger valves and correct ones cost almost as much as the pump. Pump makes a very loud sound when running. Some people have reported the pump burning out or losing power quickly. Can only be used on above ground small pools. Cartridge needs to be replaced every two weeks. This is a good inexpensive system with a lot of good reviews. It has a flow rate of 1,900 gallons per hour which is makes getting a 20,000 gallon pool completely filtered in about ten hours. It’s also possible to vacuum the bottom just using the auxiliary port while filtering the pool at the same time. 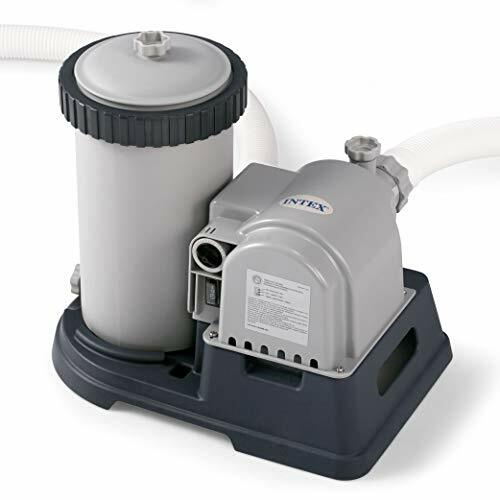 However If you plan on using this pump for the smaller Intex pools with the smaller diameter hoses, you'll need to buy a hose conversion adapter kit for 1500 gph and 2500 gph pumps. Those are relatively easy to find at e-tailers. It has a double insulated pump. The suction quality is strong enough to pick up even the smallest bits of gravel. Air release valve to free trapped air from chamber. Built in timer so that you can set operation times. Does not come with plungers or adapters. Housing is weak and prone to cracks and breaking. Pump pressure starts to fall after about two hours of running. Only suitable for above ground small pools. This cartridge filter is what’s known as a full flow element filter, it’s specially developed for above ground pools. It’s also injection molded, so it’s one piece and in that sense eliminates the worry that bits could break off. In addition being a one piece unit, it’s also created to be installed on any part of the pool via a snap-on tightening knob with no bolts or clamps. Filter head can be rotated to reposition pressure gauge and manual air valve. ​Is designed for pool capacities up to 15,000 gallons. Designed for maximum water and energy efficiency. Can be used for both in and above ground systems. 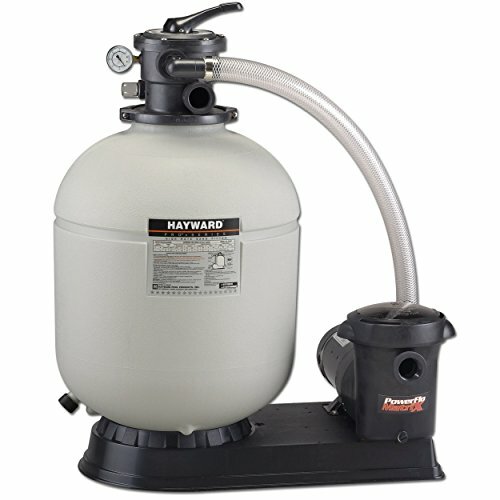 Is a stand-alone filter, a pump must be purchased separately. A 1.5hp pump will be too strong for this filter. Tends to be leaky and can sometimes clog quickly. Is a spin-on filter that will take two people to remove. Created specifically for small pools of both the in and above ground variety, this complete Blue Star system is packs a punch. You won’t need to search for additional components as everything that you’ll need is included in the package. 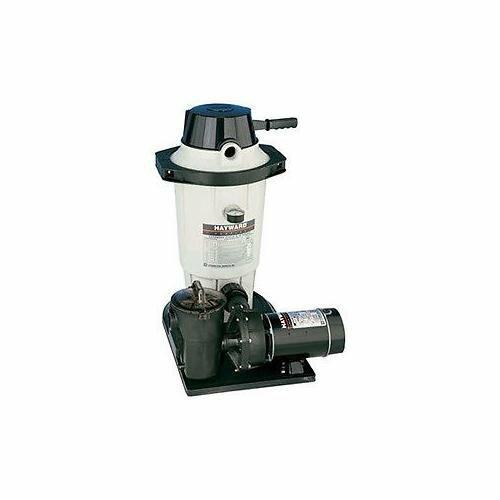 The pump that is comes with is a powerful 1.5hp pump, and the system even includes a leaf strainer and six foot three pronged grounded cord. Great for both above ground and small in ground pools. 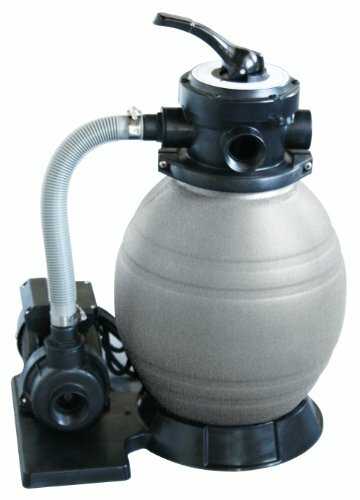 ​Complete system of pump and filter. ​Includes all hoses, adapters, converters and connectors. The pump motor is very loud, so it’s best to run in when you’re either away from home or doing something that doesn’t require quiet and tranquility. There have been some complaints that it doesn’t develop enough pressure for adequate output. 1.5hp pump may not be strong enough and may have to be replaced. Has the potential to throw off the balance of your pool if the pump isn’t strong enough. DE filters are unique small swimming pool filters. They’re made of a very fine naturally occurring powder comprised of the fossilised remains of Diatoms which are a form of algae. The powder is so fine that it filters out just about everything that’s in your pool water. It’s also relatively inexpensive and many believe the best pool filter, but it is a more hands on form of filtration than others. Because of the way that the filter works, you’ll have to add the powder to it yourself, and then remove it as well, when replacement it needed. The great thing is that they last on average about ten years. The filter parts will need periodic soaking to get rid of calcium deposits, but a special cleaner is available for this and only needs to be used overnight with added water. DE filters are great for the person that wants a completely natural system. Filters out the most debris and fine particulates of all filters. This DE filter is a pretty versatile fellow what with being able to be used in both in and above ground filters and having a filter capacity of 30,000 gallons. Because this is a DE filter, you’ll get the most comprehensive cleaning experience, as it will clean even things that you aren’t seeing. ​Can be used with both in ground and above ground pools. ​Bump handle causes the flex-tubes to clean themselves of dirt and filter powder. Backflow is prevented by integral check valve when pump is off. Injection molded one piece corrosion free filter. A pump is unfortunately not included with this system, you will need at least a 1.5hp. Plastic it’s made from is somewhat fragile and prone to breakage. There are also no instructions in the package so you’ll need to search for installation and maintenance instructions. A powerful and complete system, this DE filter system is designed to be used with in ground pools, but also includes a 1.5hp power-flo matrix pump intended for above ground pools. It also includes two six foot hoses, hose adapters and clamps as well as the instructions needed for easy, worry free installation. The capacity is 3,000 gallons per hour. Simple installation, corrosion free, injection molded and easily winterized. ​Has option for chlorine feeder on included platform base. ​Includes two pumps for use with above and in-ground pools. Pump timer feature available on unit. Designed to withstand continuous use. Newer model a secondary skimmer basket for catching more debris. This unit does have some issues with leaking, so you may need to find a way to secure couplings to prevent that. The suction pump has also been known to lose it’s abilities rather quickly and may need to be replaced often. Pumping this filter is the only way to assure backwashing so you’ll have to keep up with that manually to ensure that your chemicals are circulating properly. May need to purchase new suction pump and hosing frequently. Would you swim in a river or the lake if it were obviously dirty or otherwise not so great looking? Imagine a stench coming off a body of water, would you willing wade in a splash around? Or would you give something like that a wide berth? Just because you’re unable to see something, doesn’t mean it’s not there. These are all things that could happen. Because pool water is still, it needs external help to maintain health. You can surely try to keep your pool in motion manually, but you will never have the amount of time, strength or the microscopic eyesight needed to keep your pool completely clean and clear. How do we accomplish that then? Filters and pump systems to the rescue. As debris falls into the pool, so do contaminants and bacteria, they need to be removed or risk the chance of illnesses small and great. A pump will pull the water and push it out through the filter to clean it and catch debris. Filters will then remove debris and contaminants that cause the risk of bacterial growth, and hoses will return the now clean water to the pool. Heavy pool usage can cause pool water and chemicals to become out of balance. Water that is consistently out of balance leads to scaling on pool surfaces, massive corrosion of equipment. That leads to heightened costs associated with repairing and replacing equipment. So we’ve learned just about everything that we possibly could about small pools haven’t we? Most notably I think we discovered that they aren’t always what we think they will be. We’ve seen that they can be everything from exercise mediums. Simply pools for relaxing or wading around. Or they can be elaborate, decorative affairs. We’ve learned that even though our small pools may be less expensive and much less labour intensive than the big boys, they’re still as deserving of all the loving care we can bestow on them. And in order to maintain them what we need to do is filter like our lives depend it, because it very well could. My hope is that everything that we’ve done together today has brought you to a clear picture of what you want in a small pool filter. But not only that, now that you’ve gained all the knowledge you need to do it all yourself, perhaps you can pass this on to someone else in need somewhere in the future. So, go forth and enjoy your pools my friends.